Whether you have decided to repair your roof or entirely re-roof your home, it’s important to get the job done right. That means finding a qualified roofing contractor you can trust, which isn’t always easy. 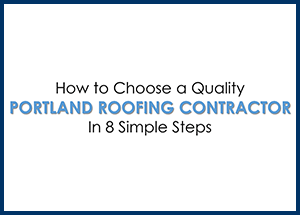 Here are 8 simple tips to help you choose a quality Portland roofing contractor. Know who you’re dealing with. Beware of the contractor that does not have a registered business name, works from an unmarked vehicle and cannot provide you with a business card, a business address and a valid phone number. Be cautious about doing business with a contractor who approaches you for work. Inspect credentials & licensing. Look for a contractor with a track record of quality and customer service. Oregon Contractors must have an Oregon CCB License. Check www.oregon.gov/ccb for licensure and continuing education requirements for your contractor.Additionally, find out how long the contractor has maintained the same Oregon Construction Contractors Board license number? The Oregon Construction Contractor’s Board issued the first license numbers in 1972. The license numbers exceeded six digits in June of 1994. A current Oregon CCB # begins in the 200000 range. A CCB number will tell you how long a company has been in business. The longer a business has been licensed, the lower the number.Sometimes a contractor will say he has been in business for 20 years and yet he has a high license number. This may be an indicator that he has had a recent business problem and has had to re-license. This might be a “red flag” indicating a problem. Beware of the contractor that cannot provide you with an Oregon CCB number. Coverage is key. A contractor should carry worker’s compensation, general liability insurance and be bonded. Request the name and address of the insurance carrier(s) and bonding company, along with a copy of the company’s insurance certificate(s).Beware of low bids which may indicate lacking, inadequate or incomplete insurance coverage and workman’s compensation. This is only one reason that going with the low bidder may be a costly mistake. Shop around for best value. Obtain competitive bids from several contractors for comparison. If you have a trusted contractor this step may not be necessary. Don’t automatically accept the lowest bid: All too often, you get exactly what you pay for. Don’t pay cash upfront. It is customary for a contractor to require a partial down payment when the contract is signed, up to 1/3 of the contract price, but a reputable contractor will never require full payment and doesn’t require cash payments. Ask for references. Your contractor should be able to provide you with a list of completed projects including the names and telephone numbers of previous clients. Take the time to make some phone calls and find out what people think of your contractor. Get It in writing. A reputable roofing professional will provide you with a written contract which clearly spells out the details of the job and pricing. Make sure that all details discussed are written on the contract. The contractor will usually have you sign the contract and he will sign it too. Expect assurance. A reputable contractor will provide you with a written workmanship warranty and written product warranty information after the job is complete.